The Many-Match feature (m-Match) lets you place a player in any number of individual and/or team matches. You can then produce a report for each golfer showing all matches in which he/she participated (individual and team) with net and gross results. m-Match can be run alone or in conjunction with any tournament in which you post hole-by-hole scores. Lets you build and report ANY number of individual match pairings for each golfer. To setup individual matches, pull down the Setup menu and select m-Match (Individuals). Click the Build all possible matches button and let TM build all possible matches for you in seconds. For example, if you had a tournament with 24 golfers the number of possible individual matches is 276 = (23+22+21…etc…+3+2+1). Drag the icon and drop into the match you wish the golfer to be in. Double click the golfer on the Players list (left side) or click and it will move to the right (onto the Individual Matches). You will notice when you add a player he/she is inserted in the match currently highlighted in the Individual Matches (right side). To quickly remove some or all players from matches, click your mouse (hold it down) and drag down to highlight all the players to remove. Then click . 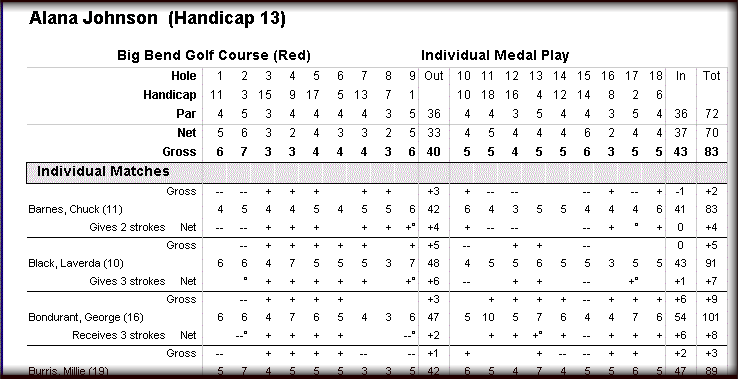 By default a player has the same match handicap as his/her tournament handicap. However, if you wish a player to have a different handicap in any match, double-click their Match Handicap and type in the new value. 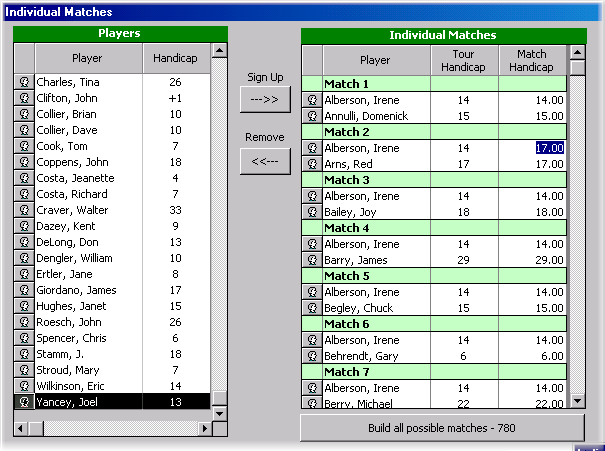 For example, on the above sample screen, notice Irene Alberson has been given a Match Handicap of 17 in Match 2, while her Match Handicap is 14 in all other matches. Lets you build up to 100 team match pairings. This means each golfer can play as a team with and against any possible combination of other players. Note: The format for team matches is a Net One Best Ball competition. The best net ball from one team is compared to the opposing team’s best net ball. To setup team matches, pull down the Setup menu and select m-Match (Teams). Assigning matches and removing players from matches. See Individual Matches above for details. It is recommended that you check the option Low handicap plays from scratch. Most best ball competitions are played where the golfer with the lowest handicap plays from scratch (0 handicap) and the others get the difference. This assures that extra strokes fall on the hardest holes on the golf course. If you check No handicap adjustment, golfers will receive full strokes. Note: If you wish a player to have a different handicap in any match, double-click their Match Handicap and type in the new value.